Ruidoso Creekside Cabin at Ruidoso, New Mexico - lodging for snow skiing, snow boarding, snow tubing, casinos, horse racing, golfing, great retail shops and restaurants. Ruidoso Creekside Cabin in Ruidoso, New Mexico offers lodging for snow skiing, snow boarding, snow tubing (great for the kids! ), casinos, horse racing, golfing, great retail shops and restaurants. There are also many family attractions including stagecoach rides, horseback rides, theatre, go-carts, swimming pools, art galleries, fishing, hiking and hunting in the Ruidoso area. “We had a magnificent stay at your lovely cabin! I can certainly understand why this holds a place in your heart as I, too, would be very partial to it. We have walked away with some everlasting memories as well. The entrance was easy maneuverable for my elderly mother and the access to the creek was something I enjoyed, listening to Cedar Creek while on the deck was very soothing to the soul. It is a place that I would most enjoy revisiting with my extended family. Thank you with all sincerity for opening your home so others may enjoy!! Ruidoso Creekside Cabin on Cedar Creek is ideal Ruidoso lodging for one or two couples or families up to six individuals. 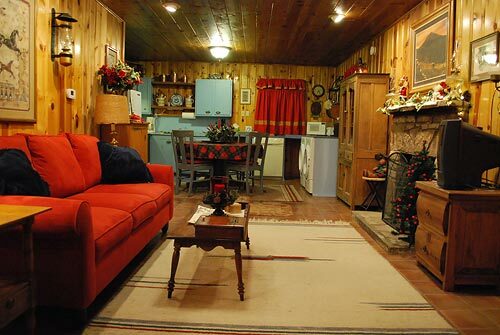 This Ruidoso cabin is a two-bedroom, two-bath cabin with a Ben Franklin stove in the living room and a gas fireplace in the kitchen/den area (approximately 1200 ft2). The Master bedroom has a Queen, and the second bedroom has a full bed. The living room also has two twin beds. Behind this vacation rental cabin is a long open deck and covered porch overlooking Cedar Creek. The cabin sleeps two couples plus two individuals comfortably (4 to 6 people recommended). Ruidoso Creekside Cabin nestled on the banks of Cedar Creek, Ruidoso, NM. The knotty pine kitchen is fully stocked with an electric stove refrigerator, microwave, coffee maker and kitchenware including utensils, glasses, plates and serving ware that will accommodate almost any chef. Adjacent to the kitchen is the den area with a gas fireplace that makes the fire starter in the family an instant hero. The Ben Franklin stove in the living room has also been converted to gas for convenient use and offers a beautiful cozy evening fire after a day on the ski slopes. Living Room, Christmas 2012. Gas fueled Ben Franklin stove on bottom right corner. Surrounded by towering pine trees along Cedar Creek, our Creekside Cabin is the ultimate escape for those who appreciate more than just average accommodations. 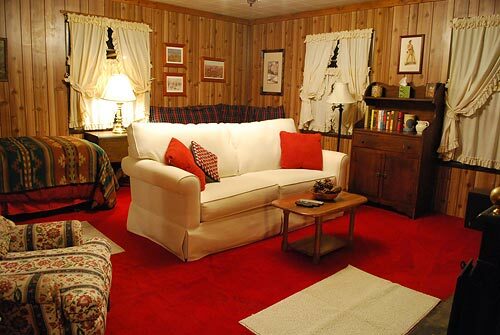 Enjoy the comfy surroundings tastefully decorated with antiques, early American revolutionary and western art. We have been very fortunate to have our Cabin in the family for over 40 years. Only recently have we taken over the management duties. We look forward to providing you a nice clean property at an affordable price so that you can make the most of your vacation holiday. Ruidoso, New Mexico is a fantastic village, from winter snow skiing and snow boarding to summer horse races and casinos year around. If you haven’t been there, we think you will really enjoy the many attractions Ruidoso has to offer. Below you will find a link to more photos. Want more info? See our Frequently Asked Questions. 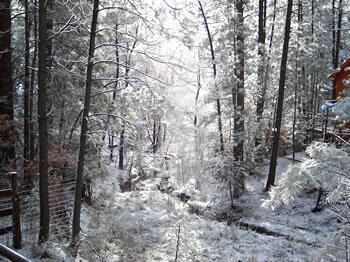 From the back porch, December 7, 2004. A five-night minimum, applicable taxes and 25% non-refundable deposit and cancellation fee are required to reserve the cabin. You must be at least 21 years old and no more than 6 individuals allowed. Your credit card will be used for your deposit (see Rental Agreement below). Sorry, No pets or firearms. Please call Cara or Bud at 325-473-4400 - Monday-Friday 8:00AM to 5:00PM CST with your credit card handy (MasterCard or Visa). After contacting us, please follow the Rental Agreement link and complete the Rental Agreement. For more information and questions please e-mail ruidoso@kazoola.com. When you make your reservation a 25% non-refundable deposit will be required. The balance due must be paid in full prior to your arrival. If something happens that you can’t make your trip, please contact us and we will make every effort to accommodate your needs. There are a lot of things to do in Ruidoso! Obviously snow skiing, snow boarding, snow tubing and the casinos are always popular if you are going in the winter. If you are going to Ruidoso in the spring, summer or fall, other attractions include horse races, stagecoach rides, horseback rides, theatre, go-carts, swimming pools, art galleries, fishing, hiking and hunting. Whether you stay with us or elsewhere, we know you will have a great time in Ruidoso. 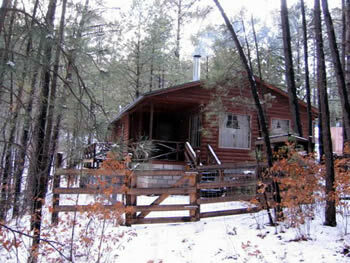 Thanks for visiting Ruidoso Creekside Cabin.